Oh, hello! It’s me! Back from the depths of a nonstop cycle of winter colds and flus and ear infections, and could someone please remind me why we moved to a different region of the country with a whole new host of germs? At any rate, things are looking up now. I’ve broken free from the homestead and am writing to you from an airplane en route to New York City, where I’m seated next to a perfectly lovely psychologist who is married to a mathematician, and besides the fact that it makes me feel like my fifth grade teacher was totally right, that I really wasn’t applying myself to the best of my ability, I am quite happy here in this metal tube in the sky, which I”m sure is full of all kinds of unspeakable germs, but that is neither here nor there. When I land, I’ll be meeting my best friend in the next terminal to embark on a ladies’ weekend in the big city, which will involve a lot of eating, shopping, drinking, and then likely slightly drunk walking and snort-laughing, and talking about how we’re doing it all without our children. It will be phenomenal. Also! This trip will also include something else that’s super exciting. I’ll be back on the on the Today Show on Saturday morning, likely sometime between 8:00 and 8:30 a.m. EST, so set those DVRs, if you’re so inclined! I’m thrilled to be capping off their “Baking Basics” week with a grand old recipe from Real Sweet. I’ll also be able to get their top-notch make-up and hair team working on my business, which, let’s face it, it really the best thing ever for a weary mother. DO ME UP. As I’m sure you can tell, I’m generally a bit high on life at the moment, and don’t want to reflect much on the horrors of February’s The Virus that Would Not Die, but I do want to share a bright spot. While housebound with a small, sorrowful boy burning alive with fever and episodes of Paw Patrol on auto-play, I decided to finally do some baking from the pages of Claire Ptak’s The Violet Bakery Cookbook, which has been a bit of a darling in the cookbook world for the past few months and a fixture on my coffee table. 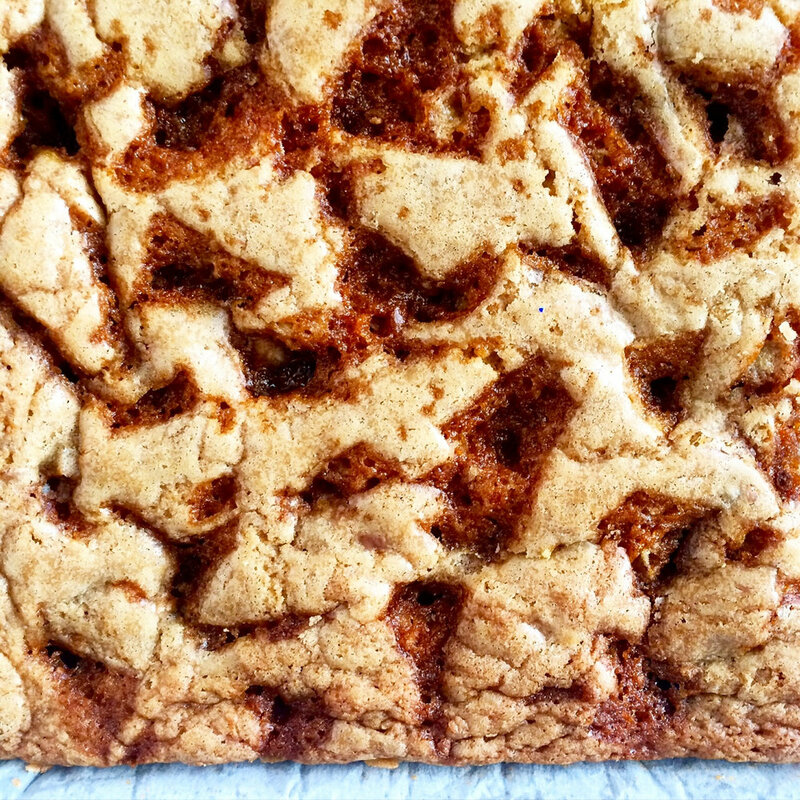 There is so much to love in its colorful pages and in Claire’s lovely writing, but the bakery’s legendary butterscotch blondies were at the top of my list. Legendary, INDEED. I’ll avoid excessive superlatives here and just say this: First, these blondies made up 80 percent of my diet for two solid days. I was basically on the opposite of the Slim-Fast plan: Two blondies for breakfast, three for lunch, and then a sensible dinner. These blondies were also the only thing the poor sick child would eat, and if you’ve ever tried to get a sick kid to eat something, anything at all, while they wither away from illness and refuse all edibles, you know what a relief it was to have these on hand. Second, it’s been a while since I bore a divot into the kitchen floor walking back and forth to a baking pan to trim off just one more bite of something so completely irresistible that you’d permanently consider giving up pants with buttons in order to have them at all times. So I had to tell you about them. They’re really, truly that good, you guys. 1. Butter. Lots. an alarming amount, really. 2. A relatively low baking temperature for bar cookies, 320°F. (If you don’t have a digital setting on your oven to choose this specific non-standard temp, just set it to 325°F, and scootch it down a bit from there). You really don’t want to overbake these gems—underbaking, with some gooeyness towards the center is the name of the game. 3. Milk chocolate. I am typically a bittersweet chocolate lady, but I’ve made these again with semi-sweet just for kicks, and they somehow weren’t quite as crave-worthy. I used Lindt milk chocolate, the good stuff. Actually, I used a 4-ounce hollow chocolate Santa leftover from Christmas and felt like a real Kitchen MacGyver. 4. Note the kosher salt. The salt level is key here, so try and use kosher salt, and I recommend Diamond Crystal kosher salt over Morton, which is coarser and much saltier. 5. Two words: Caramel shards. You caramelize some sugar, pour it out, let it set hard and shatter it like amber glass. Tuck these deeply golden shingles into the batter, where they’ll get all molten and then set again upon cooling, leaving the most incredible crisp-chewy candy-like bits throughout. Against the buttery, soft chew of the cookie? Oooooh, giiiirrrrrl. I’m going to be dreaming up more ways to use this incredible add-in in other recipes. With those items in mind, go forth and bake—the rest of the recipe comes together in a snap, no mixer required. You’ll thank me big time for this one, I promise you this. I prefer to use dark brown sugar instead of light brown, and I found that good organic butter really made a difference here. I let the caramel for the shards get quite dark, as I like the bittersweet contrast. The recipe for the caramel makes enough for two batches of blondies--freeze half the bits in a little tiptop bag for the next time you makes the blondies (and there will definitely be a next time). Start by making the caramel shards: Have a sheet of parchment paper ready on a heatproof surface, or line a baking sheet with a silicone baking mat. Measure the 2 tablespoons of water into a heavy-bottomed pan. Cover with the sugar and place over medium-low heat and stir gently until the sugar starts to dissolve. Once the sugar starts to dissolve, turn up the heat to medium-high until the sugar is a dark golden brown. Do not stir once the sugar is boiling. Pour the caramel onto the parchment paper or silicone baking mat in a thin and even layer. Leave to cool (you can pop it in the freezer for quick cooling), then use a sharp knife to chop into smallish shards. Be careful, as the caramel pieces can be quite hard and sharp! Use right away or store in a plastic bag or sealed container in the freezer. Do not store it in the fridge or it will soften, melt together, and become tacky. Makes enough for 24 blondies. To make the blondies, preheat the oven to 160°C/320°F. Butter a 12 by 8-inch baking pan and line with parchment paper. Gently melt the butter in a small, heavy-bottomed pan and set aside to cool slightly. (You can also melt the butter in the microwave, if you prefer, just don't let it get too hot). In a large bowl, whisk together the eggs, sugar, and vanilla until frothy, then whisk in the melted butter until smooth. In a separate bowl, whisk together the flour, baking powder, and salt, and add to the egg and butter mixture along with the milk chocolate pieces. Mix until just combined. Pour the mixture into your prepared baking pan and smooth the top with an icing spatula or rubber spatula. Sprinkle the caramel shards over the top and bake for 30 minutes. The center should be puffed and set but still a little gooey. Leave to cool completely in the pan before cutting. Store for up to 3 days in an airtight container.